Succulents known for their minimal care requirements and excellent cold tolerance, mounding and trailing sedums (Sedum spp.) grow in U.S. Department of Agriculture plant hardiness zones 3 through 9, depending on variety. Also known as stonecrops, the colorful evergreens typically need dividing every three to four years. To give the divisions time to establish before hot weather arrives, divide sedums when their new shoots emerge in early spring. Mounding sedums, such as 'Purple Emperor' (Sedum 'Purple Emperor') which grows in USDA zones 3 through 7, grow from a crown, or clump, of shoots. Over time, the clump becomes overcrowded, with a brown, dead center and flowers that are much smaller than normal. Water the sedum well one or two days before dividing it. This minimizes transplant shock for the divided sections. Cut any dead stems remaining on the clump back to the soil with clean, sharp pruning shears. Between cuts, wipe the blades with a clean rag or towel dipped in rubbing alcohol so they don't spread disease. Prepare the planting site for the transplants. Sedums need loose, well-draining soil and at least six hours of daily sun. Loosen the top 6 or 8 inches of soil with a garden spade and discard stones, weeds or other debris. Use as sharp-bladed perennial spade to dig all the way around the plant 4 to 6 inches from its outside shoots. Work the blade beneath the roots, rocking the spade until they loosen. Insert a pitchfork beneath the clump and carefully lift it from the soil. If it's too heavy, gently pull some outer shoots free. Shake as much soil as possible from the rootball. Break the clump into sections with your hands, each with a large handful of roots. Discard the old center. Plant the divisions in their new spot, at their original depth and about 2 feet part. Tamp the soil lightly around the roots and water them well. Trailing sedums such as Dragon's Blood (Sedum spurium 'Schorbuser Blut') -- which grows in USDA zones 4 though 9 -- set down roots wherever their stems touch the soil. 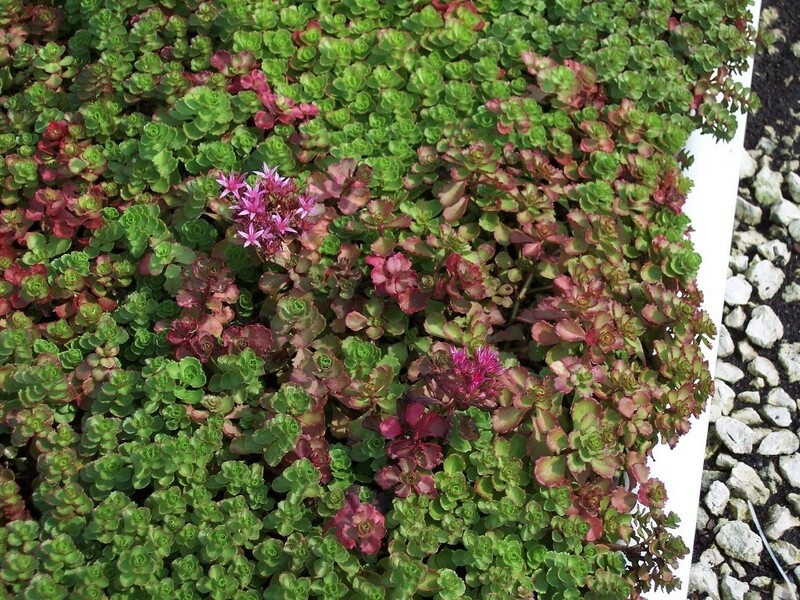 To take advantage of this, the Brooklyn Botanic Garden recommends lifting the plants in early spring as you would mounding sedums, but dividing them in two. Replant one half in the original hole, and replace the missing soil with finished compost; the trailing stems soon hide the bare patch. Leave the other half intact, or divide it into sections for transplanting to a new site.